We often camp at altitude. 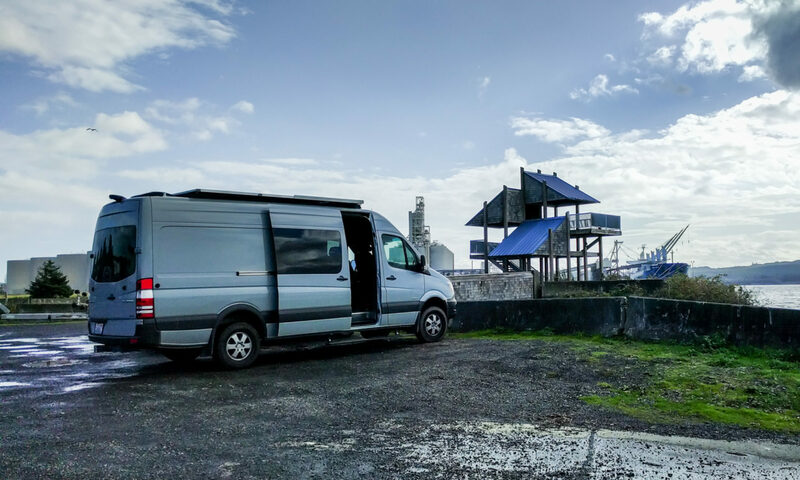 The Espar/Eberspacher Airtronic diesel heater is designed to work at sea level and soots up if the air gets too thin. Altitude adjustment kit to the rescue! This install turned out to be a much bigger headache than it should have been. The normally super-efficient German engineers must have been having a bad day when they designed the altitude kit for the Eberspacher D2 heater. None of the connectors supplied with the heater and the altitude kit work with each other. Apparently, the connectors are meant to hook up to the 7-day timer. Most Airtronic heaters these days come with the Digimax controller instead. To install the altitude kit in this system, you need to splice some wires and add a switch. You also have to ignore several of the existing wires by taping them out of the way. Crazy, but true. 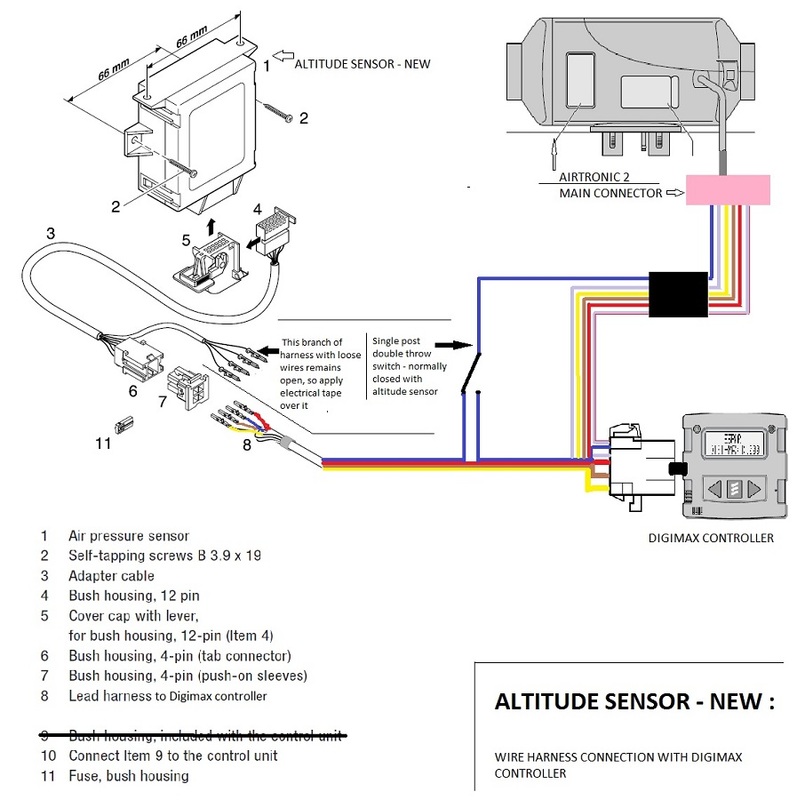 Here’s the wiring diagram for the new-style altitude sensor. It’s not clear, but basically you have to splice a switch into the blue and white wire so that it can serve double duty, either talking to the altitude sensor (this is how the heater knows to reduce the amount of fuel it sends to be burnt) or connected to the DigiMax controller so that you can read any error codes that the system may have generated. 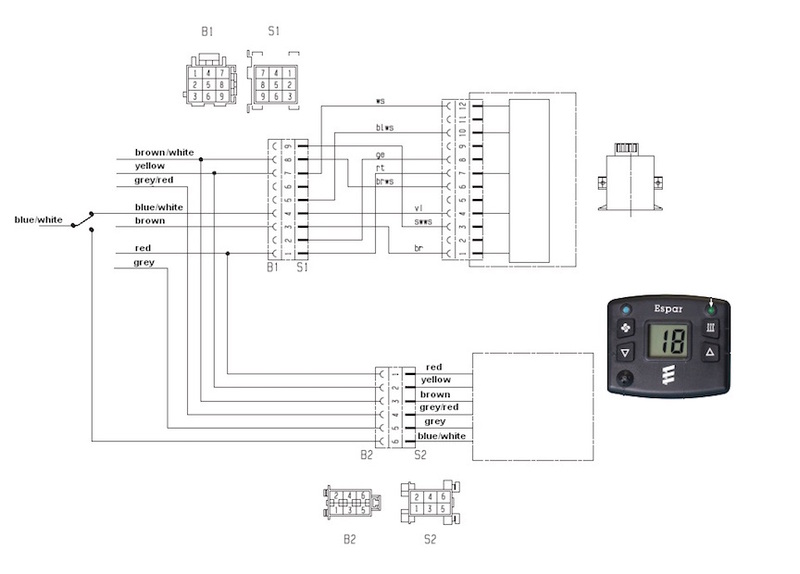 The wires can be tapped anywhere along the length of the main harness. We chose to put our altitude sensor near the heater, so we just found the correct color wires at that end of the harness and hooked in to them by adding taps using our own wire. We cut the blue/white wire and installed a single pole double throw (SPDT) switch. You can find lots of suitable SPDT switches on Amazon. This one has terminals that accept crimp-on quick connects. The center terminal of the switch is connected to the heater end of the blue/white cable. The other two terminals are connected to the blue/white wire for the altitude sensor and DigiMax controller. Just remember, the toggle switch will point in the opposite direction to the wire that is “On” at that time. Make sure that you tape the unused wires out of the way and completely seal them off so that they can’t short out on each other or on any other objects. If you have an older system, the altitude sensor might have a different look, a different connector, and a different set of wires. Here’s the diagram for that version.